These kids are adorable and beautifully dressed. They are wearing their scarves around their waist instead of around their neck. The two kids are sporting great coats and winter hats. 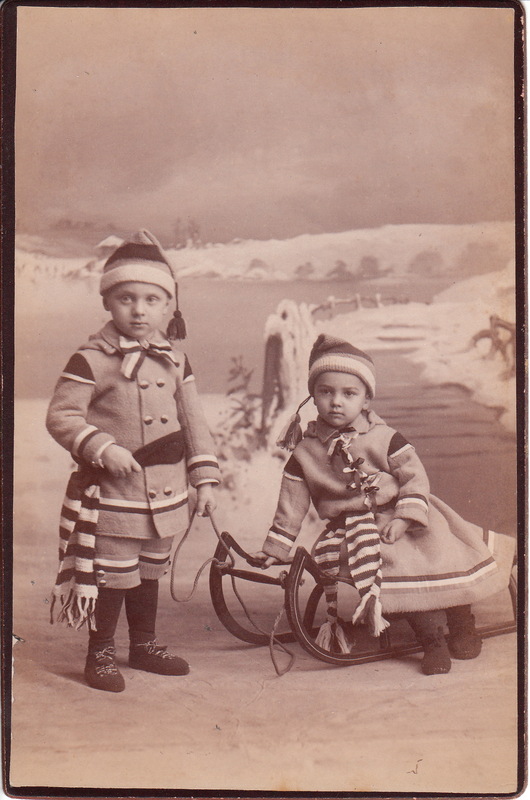 The oldest child hold the sled’s rope while the youngest child sits on the sled. The youngest child has many ribbons on the front of his/her coat and the bottom of his/her coat is styled as a skirt. The older child is wearing a shorts suit. Note the wintry snow covered scenery in the backdrop. The reverse of the cabinet card has an inscription stating that the kids in this photograph are the “DuPont Children”. Could they be part of the famous DuPont family? The photographer’s name and the location of the photographer’ studio are unidentified. 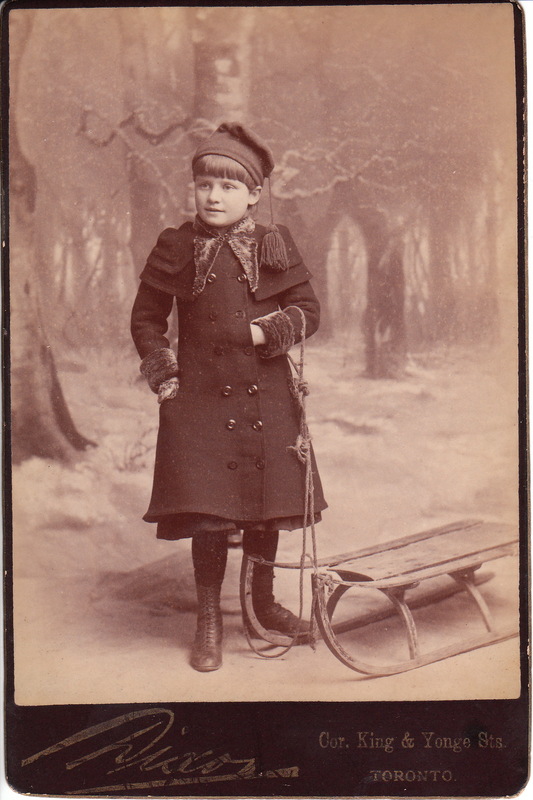 A young girl, buttoned up in her fur trimmed winter jacket, poses with her sled in front of a painted winter scene. She is wearing a cute cap with a tassel and is pulling her sled by a rope. The photographer of this image is S. J. Dixon. Dixon’s Electric Light Photo Gallery was located in Toronto, Canada. The studio was established in 1872. Dixon was very involved in the Photographic Association of Canada, holding a number of offices on the executive committee. He became the organization’s President in 1889. Dixon was a noted athlete and acrobat. The Photographic Times (1891) reported that he walked a three quarter-inch wire stretched across the Whirlpool Rapids at Niagara. “The cable was from 300 to 400 feet above the torrent, and stretched about 400 feet in length”. He completed the “perilous journey” in about 17 minutes. During his tight rope walk, he performed various antics, including lying at full length across the wire. Not surprisingly, Mr. Dixon insured that his feat would be recorded for posterity. J. C. Hemment, a well known instantaneous photographer, photographed Dixon during his mid-air walk. Kate Claxton (1848-1924) is the subject of this cabinet card portrait. Claxton was an American stage actress who made her first appearance in Chicago with Lotta Crabtree in 1870. That same year she joined Augustin Daly’s Fifth Avenue Theatre in New York. In 1872, she became a member of A. M. Palmer’s Union Square Theatre in New York. She played mostly in comedic roles. She began starring in theatrical tours in 1876. In 1876 she was performing the play “The Two Orphans” at the Brooklyn Theatre (in New York City) when a fire broke out killing 278 people. Soon after the tragic fire, she was in a St. Louis hotel when it caught fire and she made a narrow escape. After the two fires, Claxton was viewed by some audiences and theater professionals, as bad luck and a performer to be avoided. There are some interesting asides about Claxton. First, the town of Claxton, Georgia was named after her in 1911, Second, her father was Colonel Spencer W. Cone, who was the commander of the 61st New York Regiment in the American Civil War. This cabinet card was photographed by Schloss, a famous New York celebrity photographer. To view other photographs by Schloss, click on this site’s category “Photographer: Schloss”. The reverse of this card has a hand written notation stating “Empire Theatre”. 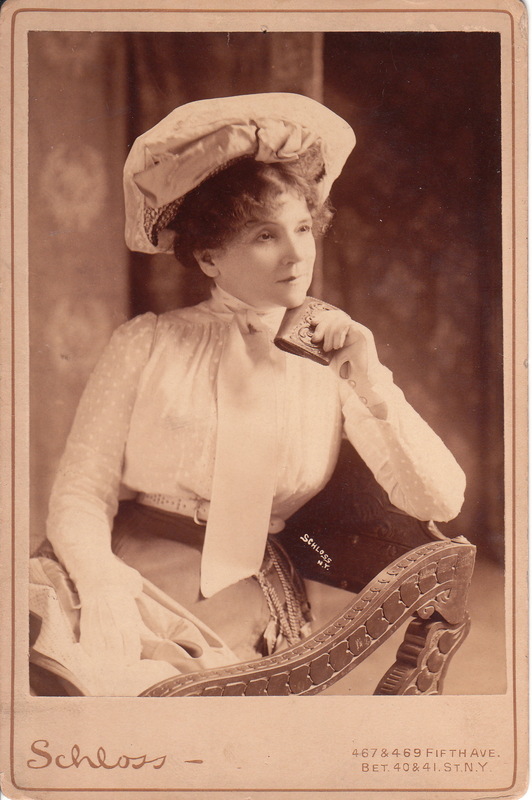 Perhaps this photograph captures Kate Claxton in costume for a role she played at the Empire. 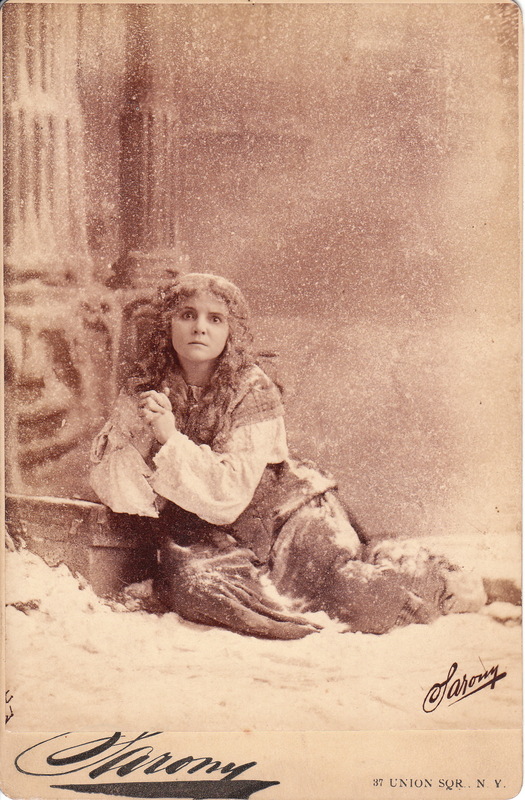 The second cabinet card captures Claxton sitting on the ground during a snow storm. The staged scene in this image is likely from one of Claxton’s performances. This photograph is by Sarony, famed New York City photographer. 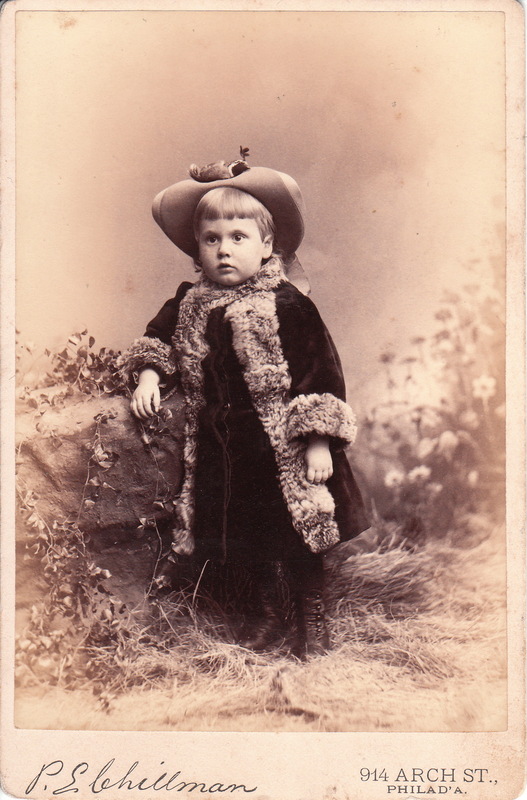 To view other images by Sarony, click on Cabinet Card Gallery’s category “Photographer: Sarony”. This cabinet card captures a little girl snug in her sled. Standing beside her, is her father. Both are wearing winter clothing including gloves and a warm hat. 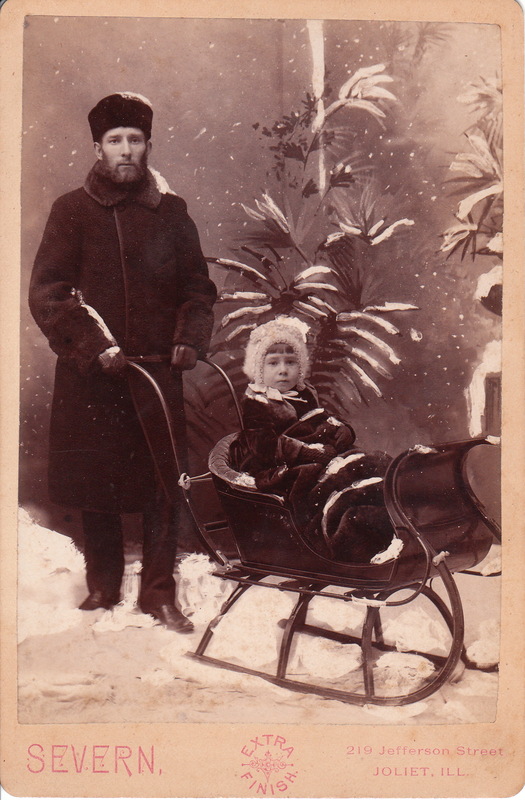 This photograph was taken inside a studio and the setting includes fake falling snow and fake snow on the ground and sled, as well as on the man and his daughter. The photographer is Severn, of Joliet, Illinois.